1983 – graduated from the Moscow Art School named in memory of 1905, art studio of Y.G. Sedov. 1991 – joined the Union of Artists of Russia. Since 1980 N. Burtov participates in exhibitions: regional, republican, all-Union, international. Works are exhibited in art museums of Russia, Ukraine, Belarus, in private collections of many countries of the world. 2005 – Serpukhov Central Exhibition Hall, Serpukhov. The first acquaintance to Nikolay Burtov's works has left strong impression already. His compositions bore a feature of individuality and, at the same time, brought in memory high samples of the European level. The triptych ‘Our Brass Band’ was presented at the All-Union exhibition of young artists in the Manege Hall (1988). In the central part there was a brass band backgrounded by modern marchers with newspapers sticking out of pockets and reflecting together with decorations on a sparkling brass of pipes. To the right and to the left there were orchestras of demonstrations from Stalin and Brezhnev times on a background of marchers with portraits of leaders. A fair seeing-off a leaving epoch of ‘advanced socialism’. The work was mentioned by ‘Vremya’ TV program as the most significant socially orientated sample and later purchased by the Ministry of Culture. In 80s, works ‘Holidays’, ‘Ferapontovo’ and ‘Workbound’ have further developed a social theme. Landscape became a new step in the development of the artist’s creativity. His early landscapes were marked by a dark intense colouristic spectrum built-up by a counterpoint of fulvous-brown and light, snow-white, immersed in a silvery flickering space. As if the twilight sky lowered on the ground, and it became a part of a universe. Dwellings and slightly designated human figures stayed on the bottom of the world ocean. These landscapes, as it seems to us, have defined much in the creativity of the artist and have helped him to estimate in his own way a role of a man in this world. At the big personal exhibition (Podolsk, 1999г.) there has appeared a layer of works, which could be styled as ‘our history in Nikolay Burtov's completely non-historical canvases’. Out of 140 works of recent years the exposition included ‘Self-portrait’ and six still-life canvases, while the rest formed up landscapes which conveyed an architectural motive almost in every case. Life of an individual has just ceased to interest the artist. People are just slightly accentuated in the composition, while the architecture appeared to be one of significant elements. The architectural motive became a personification of time, a fusion of efforts of the whole generation of people. Thus time has found its ‘face’ in paintings of Nikolay Burtov and became a sign of our history. 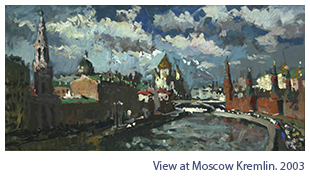 It is at that time the artist has identified the themes of a ‘historical landscape’: Moscow – an ancient capital of Russia, the forgotten by God and people province of Russia (the empire of the Soviet Union did not exist any longer), and the nobility manors which became memorial estates. A completely special feature which had been never seen in the works of modern or old artists has appeared as a ‘portrait of house’. 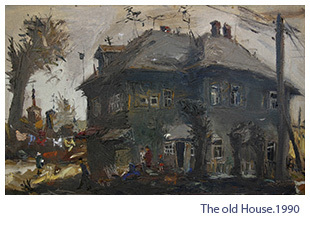 There were only few such works, but the most amazing, just a masterpiece of painting was ‘Old House’, 1990. Gradation of grey, violet, bluish tints in a heavy weight of the house are confronting the streams of golden light on the left and on the right at the gloomy sky covered by clouds. This is possible as we see not a landscape of a condition - time of day or a season, but a ‘portrait of house’, on a background that may be interpreted depending on the central image. The ‘vanity of mice life’ is accentuated on the foreground by active color spots - green, red, dark blue. The statics of the house is compared to a slow rhythm of life of its inhabitants. Its inhabitants come and go, and the house is sated with their passions, it inflates and deforms, but still floats through the time. It seems the events of human life give it the color, special shape and, probably, its own unique destiny. The house has become a personification of the time and destinies of the inhabitants. That very period the artist made the next step in the historical landscape creation. And we should to ascertain: in modern art we know nothing similar to what Nikolay Burtov has made. We mean the composition ‘Red Rows. Podolsk’, 1991. If the ‘portrait of house’ aspires to a square form, this landscape presents a horizontal composition. There are three horizontals, and each one with its rhythm and color palette is adding to a complex harmony of the whole. Dense, conjoint painting of the foreground with slow movement of pedestrians is contrasting to the violent streams of cars on a highway where speed blurs the shapes of objects. A row of old merchant houses with gateways leading to back yards trips the movement and closes a horizon. Intensive-red color of houses draws a line which is broken by clumps of trees. Their outlines, as well as contours of cars on the road, seem a little bit blurred, maybe, because the houses belong to the other time with a different speed of life. A low dull sky lowered down on the roofs. As if we’re obviously seeing neither pedestrians, nor cars, but a stream of time itself. Invisible time is shown by the artist through a confrontation of rhythms in the landscape. No one has presented the time this way. It might be because only a few realize: we live within a historical environment. The work of a true artist is both reflection and confession with a paintbrush in hand. However, this is not a rational but creative process actively involving the intuition. 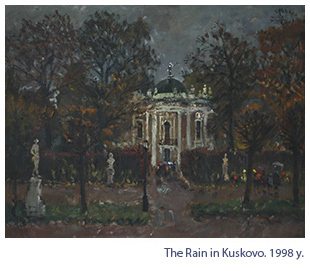 In ‘Rainy Day in Kuskovo’, 1998, sculptures of ‘Dianas’ and ‘Aphrodites’ interestedly observe a stream of tourists going to a palace, and we’re trying to penetrate into a long gone life once raging in the palace and pavilions. As if the manor continues to live its own life. The time and streams of visitors are flowing by, while secrecy of its atmosphere remains untouched. The landscape ‘Summer Day in Kuskovo’, 2004, shows a part of the alley leading to a pink pavilion in full sun light when the materiality of objects is dimmed in the haze of luminous air. A stone house, a sculpture, the ground and trees - all is sparkling with sunny patches of light. Luxuriance of light is expressed by an open pastose stroke as once France impressionists could only do. The spontaneity of light with blue, lilac, pink shadows gives almost physical sensation of a hot sunny day, and the mysterious past is hiding away from dazzling light. The ‘Russian impressionism’ in the works of Nikolay Burtov has presented itself most brightly at his personal exhibition in Podolsk Central Exhibition Hall, in 2004, where 100 out of 167 compositions were dated by 2003-2004. The technique the French artists have discovered and developed in the second half of the XIX century, appears to be proper to express a certain stage of our life. Everything is matching to the temperament of the artist here: work in the open air, a confessing sincerity of painting, a sharp sensation of the moment. The term ‘impressionism’ in exact translation means ‘impression’. It is important, how deep and wide this impression reflects our time. Probably, long travels the artist had made to Cuba, to Indonesia, the international open-airs in Gurzuf and Belarus have sharpen the feeling of history always inherent in the artist, and the sensation of national features and peculiarity of the modern situation. Now, different culture and spirituality come to this country. A diverse image of the ancient capital of our country has been presented in the works of the artist as never before. 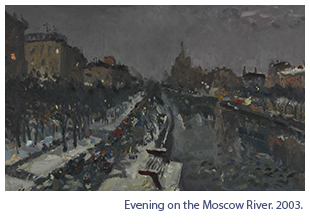 In ‘Evening over Moscow River’, 2003, the image of megapolis sounds different: we see the river of life, mighty and deep, embanked by heavy and bulky houses of Stalin times. A skyscraper is looming up above horizon. Streams of cars and streamlets of pedestrians are flanking the river, as its imperceptible and powerful flow remains the main motive. The pinkish light of sunset sky and the cold gray-blue smooth water surface bring a timeless sounding to the motive. ‘Moscow Kremlin’, 2003, is one of the most well-known architectural motives of Moscow and therefore one of the most difficult to picture. N. Burtov does not aspire to impress us by the height and might of defensive works. Among the few others, he interprets the Kremlin as a human handwork, as something the people needed. Its handicraft character makes alive even the most solemn ensemble. Our ancestors built it up and it is still alive for us. Moscow temples have acquired significance, became an organic part of the city environment. ‘Moscow. Pyatnitskaya Street’, 2002, reflects a cold winter day. Blue shadows, sparkling air filled with pieces of ice. A white temple adorned with a stucco moulding, a sky-punching silhouette of a beauty–belfry of the XVII century. Blue, pink on a snow along with red stains of passer-bys’ figures produce an impression of enchanting luminescence. The interpretation of Russian countryside town motives has changed a little: now it is an image of a family nest where two or three generations have lived. ‘House of a Blacksmith in Tarusa’, 2003, cannot be treated as a ‘portrait of house’. The house stands in the street, in a number of other houses though it remains the center of the motive. It is a mighty and well-groomed stone house. The number of aerials on a roof shows several generations of a big family living in the house now. It is a big street, and the house is close to the center of a small town. There are many similar houses still preserved in old towns. Thus it is a history of a provincial Russian life: a still instant of a swift-flowing life. The artist’s sympathy for this modest world of beauty of the Russian province is very important. Now, the riches of reddish-crimson, dark and pale blue, brown-olive and variety of green tints altogether attract the artist creating a unique show. In our opinion, not less significant there has been revealed the theme of human life presented in a still-life. Usually, it is a flower still-life. It coveys no flower symbolics, as in works of old masters, as it is alien to the spirit of modern culture of our people, but the remained symbolics of an object is easily read in the created situation. 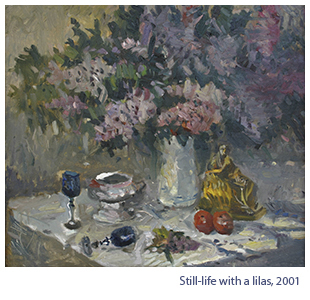 ‘Still-life with a Lilac’, 2001, is a love story, indeed. It tells of a house, finally found, where the lilac blossoms and an armful of flowers may be put in a vase. It is so nice to sit at this table together, to drink wine from cyan-blue happy wine-glasses. And a gold sitting statuette which happened by chance on a table is a gold dream in reality. Silvery-lilac air is filling up the empty space when the hosts left the table and keeping up a soft charm of the mood. The same motive is conveyed in ‘Still-life with a Mirror’, 2004, where it acquires a sun light amplified with a light reflection in a mirror. The stream of light becomes a burst of pleasure, a violence of feelings, thus loosing a charm of mystery. An absolutely special quality is inherent in a still-life ‘Falling Peonies’, 2004, where the beauty of flowering and grief of withering are mixed together. The still-life is made as if in an instant. Harmonies of whimsical color combinations easily enter the soul of a spectator. It seems we look at a natural motive where nothing is touched with the artist’s brush, nothing is added to what everyone can see. The artist has simply attracted our attention, has forced us to peer at the life of nature. The flowers are stretching out to us for we could have seen them better. Heavy branches have lain down on the grass as living things, moving closer to us. Here, like in music, we enjoy the burst of life pleasure, and silvery accompaniment of the main theme – the grief of withering. The frameworks of genres appear dim and contain an unexpected interpretation along with significant contents. It is inverted to both senses and mind. Possibly, those images of Moscow, the Kremlin, the temples altogether embody the community of the Russian people, a realized reunion of people and spiritual primacy above commonness on the edge of centuries. All motives are presented in virtual or real relation to the streams of people. This opinion is in no way instructive: believe it or not, please, take it as something related to our natural landscape. No pose of a law scholar or a prophet is intended. Nikolay Burtov is a master, the one who creates beautiful painting, which is to convey his sincere hearty warmth and affectionate thought.